It all started with Mussel Floats in 1980. They were being smuggled across Cook Strait by fishing boats to keep the fledgling mussel industry going. Rail had the monopoly on freight and was charging an ‘arm and a leg’. We built a machine, some moulds, and went into production. Out of the Aquaculture industry other opportunities presented themselves; first the 12 kg and 25 kg floats, and then the 320kg marina buoy evolved. The scientists were now getting to grips with the industry and wanted information from the water column such as salinity, turbidity and temperature. The Buoys that Indac has developed for research groups have a range of sensors, solar panels and cell phone aerials. The latest of these are now being used in the North Island lakes to monitor pollution. Waikato University has a number of projects running using Indac Buoys for both deep and shallow water, which phone in information 24 hours a day 7 days a week. 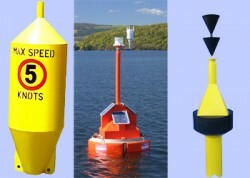 Around the coast of New Zealand there are a number of Indac buoys acting in warning, safety and advisory applications. These buoys are small versions of the deep sea navigation and warning buoys and are ideal for the National Parks and Marine reserves. They serve as navigational aids, hazard warnings, light providers, information collectors, and assist with environment and water management. In a number of applications spray on graphics that heat fuse into the buoy make customised buoys an economic option. 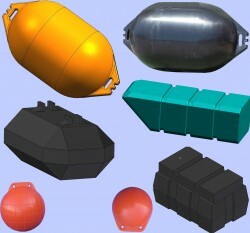 Indac's marker buoys are moulded fron UV stabilised medium density…. Read more……. 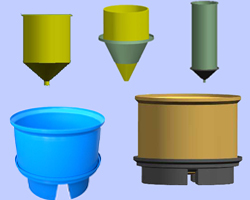 Indac's floats are moulded fron UV stabilised medium density…. Read more…….